Is your pooch a little pasty? Time for some sun! Long Beach - Dog Beach Zone The Long Beach off-leash Dog Zone is a 3-acre, non-fenced site in Belmont Shore that was started by Justin Rudd - founder/director of Haute Dogs. Daily hours are 6 a.m. to 8 p.m. Between Argonne and Roycroft avenues in Belmont Shore. NOTE: Only one dog per adult. This is the only legal, off-leash dog beach in LA County. Details at www.DogZone.org. Coronado Dog Beach At the most northern end of the beach next to the Naval Air Station. Wide and sandy, with the Pacific surf and the Hotel del Coronado in the background/ Located on Ocean Blvd. near Sunset Park.Del Mar - Dog Beach A nice, low key spit of sand to let your dog roam in lovely Del Mar, but with limitations: the off-leash designated is seasonal only, so bring your dog without its leash only from September to June. Parking is also at a premium, and parking tickets flow freely in Del Mar. Camino del Mar. Huntington Beach Dog Beach On the Pacific Coast Highway between 21st St. and Seapoint St.; 100 Goldenwest St., 92648. Open 5 a.m. to 8 p.m. daily. 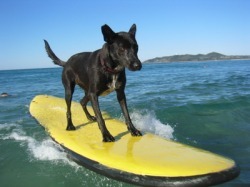 Dogs may be off-leash in the water and on the wet sand -- three quarters of a mile long. Fiesta Island - Mission Bay (San Diego) Most of this large sandy island in Mission Bay is designated leash-free for dogs and a fenced in area is provided about 3/4 way around the one-way road that circles the island for dogs that need to be contained. This area is 3+ square miles with the beach on one side and lots of room to run and trails to follow before you reach the fence that runs along the road. Lots of sandy dunes to romp in, and the calm bay waters lets the more adventurous dogs take a quick dip. Gates close approx. 10 p.m. Ocean Beach (San Diego) - Located in northern Ocean Beach, Dog Beach is the original dog beach and one of the most popular places to take your dog. This beach area is located at the west end of the San Diego River Floodway, also known as the Ocean Beach Flood Control Channel. With a wide swath of sand and the Pacific surf to roll in, Dog Beach is a special place to bring your mutt, or just to come and watch dogs be dogs in the surf and sand. Open 24 hours.